I am behind on posting it, but here we go. This video has already attracted a staggering number of worldwide views, but I thought I would (should) present it here for posterity. Kudos to everyone at the charity Hope 4 ME & Fibro NI who organised the event (back in October), shot the video, and edited in the slides to create such a polished finished product. 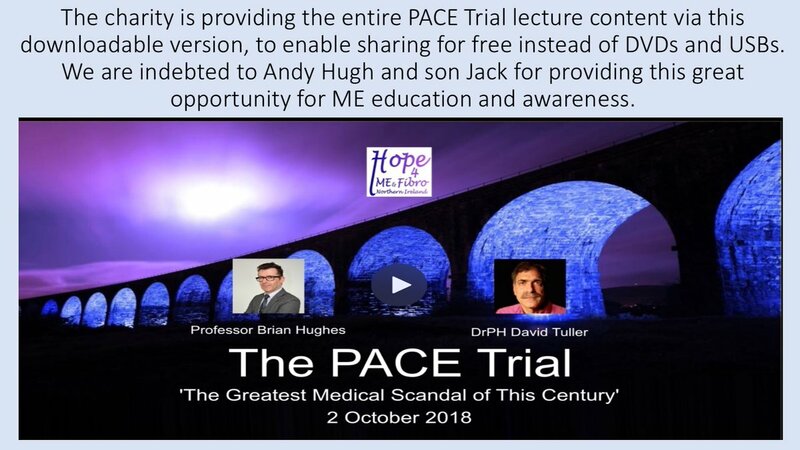 The video concerns the PACE Trial, a highly troubled British research study into therapies for chronic fatigue syndrome (and, by extension, myalgic encephalomyelitis). You might recall that I’ve blogged about this before (here), as well as featuring it in Psychology in Crisis. The video is a twofer: after my talk (the first forty minutes or so), you will see a second lecture by David Tuller, senior fellow in public health and journalism at the University of California–Berkeley’s Center for Global Public Health, and high-profile commentator on ME/CFS issues. I am aware that the video has been widely viewed within ME/CFS circles, but I believe the issues involved have much wider relevance, relating as they do to the state of psychology as a science, the way research design impacts directly on public health, and the pernicious manner in which medical and academic establishment-types can prove resistant, if not outright hostile, to well-informed professional critique.